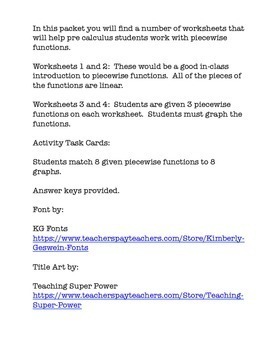 In this packet you will find a number of worksheets that will help algebra 2 and pre-calculus students work with piecewise functions. 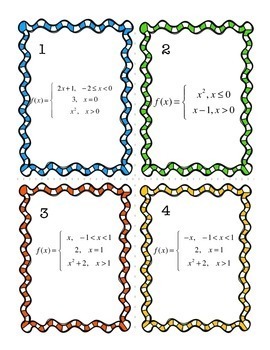 Worksheets 1 and 2: These would be a good in-class introduction to piecewise functions. All of the pieces of the functions are linear. 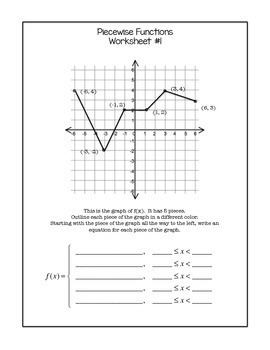 Worksheets 3 and 4: Students are given 3 piecewise functions on each worksheet. Students must graph the functions. An additional blank worksheet has been provided so you can make up your own piecewise function question. Students match 8 given piecewise functions to 8 graphs. 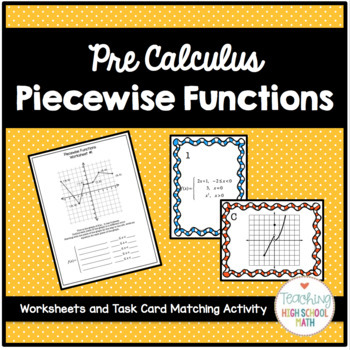 Need more fun activities, worksheets, puzzles, and notes for First Semester PreCalculus?